In the world of entertainment, it's easy to distinguish right from wrong, good from bad, and beautiful from ugly. That's part of what makes entertainment entertaining, because it shields us from the cares and confusion and nuance of reality, and lets us enter a world of clarity and simplicity and thrilling success. But when we expect the same of the real world, we're choosing a path that leads to trouble. 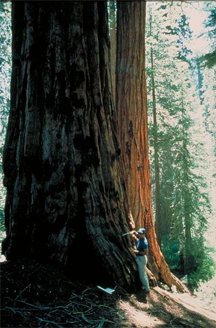 The giant sequoia, the largest tree species on Earth. Sequoia seeds germinate best when they come into direct contact with mineral-rich soil, which is a rare event in forests carpeted with leaf litter and debris. Fire tends to clear the forest floor, which helps the sequoia seeds by exposing the soil. It also opens areas of the forest that the young trees need to grow. For more, see "USGS Studies Wildfire Ecology in the Western United States Part 1." Photo courtesy U.S. National Climatic Data Center of the U.S. Department of Commerce. The complexity of reality appears in almost everything we do at work — workplace politics, negotiations, making design trade-offs — even choosing friends and allies. We have to "take the good with the bad" so often that the phrase itself is a cliché. Accepting what we don't want as a means of getting what we do want isn't always hypocritical — rather, it can be an acknowledgement of the variety and complexity of the real world. Little in life — some say nothing in life — is all good or all bad. Even that statement is mixed. It means that the most horrible events can have some good consequences — difficult as they might be to see at first. Just as there are trees whose seeds cannot germinate until fire chars their forests, there are projects that cannot find funding until bankruptcy threatens their companies. And even the most wonderful events can have some bad consequences — unwilling as we might be to see them at first. Rain falling on arid land is the salvation of most of the plants it visits — except those living in the no-longer-dry arroyos that carry the inevitable flash floods. And successful market-dominating products can lead companies to concentrate on existing customers longer than they should, freezing those companies out of new opportunities until too late. If we choose to, we can usually find the bad in any experience. That can be worthwhile, when finding it leads to learning, or when it helps us avert failure. It can also be wasteful, when focusing on the bad drains us of energy or leads us to miss whatever joy or thrill the experience offers. all good or all badAnd we can also choose to emphasize the good of any experience. Sometimes the good is hard to find, or we must put some time or distance between the experience and ourselves to fully grasp the good. Finding that good can give the experience meaning, especially when the discovery requires real effort. But it can also insulate us from important lessons, when we reject the whole of the experience to accept only that good. Would you like to see your comments posted here? rbrenzocxTZFMXaMUQBDfner@ChacvMwTnAbZqfcysWpvoCanyon.comSend me your comments by email, or by Web form. I offer email and telephone coaching at both corporate and individual rates. Contact Rick for details at rbrenotfRmSEekLmIJMlmner@ChacPHlQLqyyApdkzQkBoCanyon.com or (650) 787-6475, or toll-free in the continental US at (866) 378-5470.